Background: The increase of oxidant compounds is the most well-known reasons for the tolerance to the analgesic properties of Morphine. Additionally, the production of proxy-nitrite impairs receptors, proteins and enzymes involved in the signaling pathways of analgesia, apoptosis and necrosis. Also, we revised all patents relating to opioid tolerance control methods. Objective: The aim of this study was to assess the effects of Alpha-tocopherol as an anti-oxidant agent to reduce Morphine tolerance. Method: Forty male rats randomly divided into four groups. 10 mg/kg of morphine was injected subcutaneously to create the desired level of tolerance. After modeling, 70 mg/kg Alpha- Tocopherol was injected intraperitoneal. Also, the hot plate recorded pain threshold alterations was used to evaluate the behavioral test. All tissue samples were extracted from the spinal cord, thalamus and frontal cortex for molecular and gene expression evaluations. Also, the effect of Alpha- Tocopherol on the apoptosis and necrosis parameters was analyzed using nissl staining and tunel test. 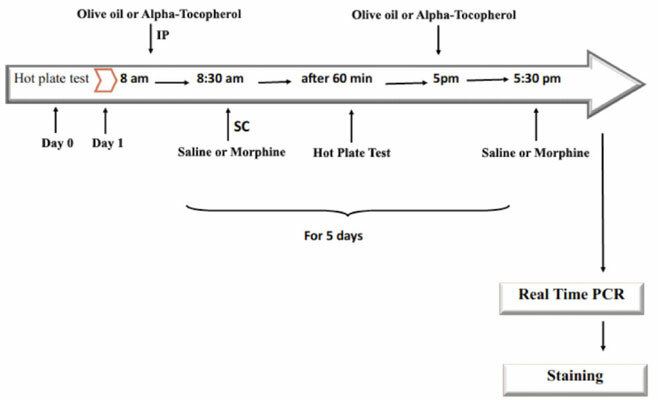 Results: The time latency results showed that there were no significant differences in the different days in groups treated with Morphine plus Alpha-Tocopherol. However, our data highlighted that the pain threshold and their time latency in respond to it had substantially increased in comparison with the control group. Furthermore, we found that the Alpha-Tocopherol obviously decreased c-fos gene expression, especially in the spinal cord. Conclusion: Thus, co-administration of Alpha-Tocopherol with Morphine can decrease the adverse effects of nitrite proxy, which is released due to repeated injections of Morphine. Alpha-tocopherol, morphine tolerance, C-fos, peroxynitrite, proto-oncogene, morphine.